LaPuerta Books and Media announces release of Gerald Everett Jones‘s new novel, Mr. Ballpoint, humorous fiction inspired by the true story of consumer mania for the first ballpoint pen. The book is currently available from booksellers worldwide in hardcover and Kindle. An exuberant entrepreneur who had already made and lost several fortunes, Reynolds bragged that he “stole it fair and square.” This novel is told from his mild-mannered son Jim’s point of view, about coping with Milton’s outrageous schemes, then their sudden success. Although Jones wrote the book for general audiences, teachers and librarians have commented that it’s an appropriate read for young adults – an ideal book-report assignment. In an engaging and funny story about the foibles of fathers and sons, students get a vivid description of the post-World War II era, including the beginnings of mass-market advertising and the often wild schemes of entrepreneurial capitalism. Magdalena Ball, host of The Compulsive Reader, said: Gerald Everett Jones certainly knows how to tell a story. Engaging, funny, and full of the cross-genre capability that marks all of Jones’s novels, Mr. Ballpoint will surprise and delight readers of all ages. This is author Gerald Everett Jones’s eighth book for LaPuerta. His first was the tongue-in-cheek business title How to Lie with Charts. He is also the author of the “boychik-lit” series of Rollo Hemphill Misadventures, including My Inflatable Friend, Rubber Babes, and Farnsworth’s Revenge. He holds a Bachelor of Arts with Honors from the College of Letters, Wesleyan University, where he studied under novelists Peter Boynton (Stone Island), F.D. Reeve (The Red Machines), and Jerzy Kozinski (The Painted Bird, Being There). Claiming he’s inspired by the humor of P.G. Wodehouse and James Thurber, author Jones blogs on the topic of male-centered comic fiction at Boychik Lit (www.boychiklit.com). Renowned author Anne Tyler’s numerous bestsellers include Accidental Tourist and The Beginner’s Goodbye, as well as the forthcoming A Spool of Blue Thread. Critics claim she presents an “angel’s-eye-view” of her characters and judges none of them harshly, including the stinkers. Jones has said he regards Tyler as his “literary mother,” and Christmas Karma is his holiday gift to her readers. In Christmas Karma, main character Willa Nawicki is bewildered by a series of curious karmic events that literally ring her doorbell during the frantic season, awakening years-old resentments and stimulating ever-more-intense personal confrontations. These bizarre visitations include a grizzled old man claiming to be her father Sid, who has been missing for some thirty years but now says the title to the family home is in his name – and now he wants the place back. This is author Gerald Everett Jones’s ninth book for LaPuerta. His first was the tongue-in-cheek business title How to Lie with Charts. He is also the author of the “boychik-lit” series of Rollo Hemphill Misadventures, including My Inflatable Friend, Rubber Babes, and Farnsworth’s Revenge. His novel Mr. Ballpoint, released earlier this year, is a comedy treatment of the Pen Wars of 1945. He holds a Bachelor of Arts with Honors from the College of Letters, Wesleyan University, where he studied under novelists Peter Boynton (Stone Island), F.D. Reeve (The Red Machines), and Jerzy Kozinski (The Painted Bird, Being There). He blogs about male-centered comic fiction at www.boychiklit.com. · Magdalena Ball, host of The Compulsive Reader: Gerald Everett Jones certainly knows how to tell a story. Engaging, funny, and full of the cross-genre capability that marks all of Jones’s novels, Mr. Ballpoint will surprise and delight readers of all ages. All of Mr. Jones’s novels are available from Barnes & Nobel and Amazon, in paper and Kindle formats. 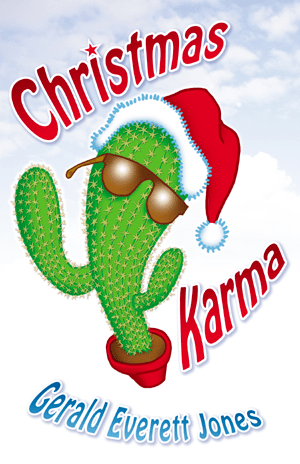 Release date for Christmas Karma is November 8, 2014. With offices in Santa Monica, California, LaPuerta Books and Media is an imprint of La Puerta Productions (www.lapuerta.tv). The LaPuerta imprint and its logo — an open door — symbolize unlimited access to knowledge, opportunity, innovation, fascination, and delight. Gerald Everett Jones is the author of the recently released humorous fiction novel Farnsworth’s Revenge. Santa Monica, CA, April 8, 2014 – Gerald Everett Jones, boychik-lit author of the recently released Farnsworth’s Revenge, is scheduled for appearances at the Los Angeles Times Festival of Books (USC campus) on the afternoons of Saturday, April 12 and Sunday, April 13. Jones will be meeting fans and signing books in Booth 131, sponsored by the Independent Writers of Southern California (IWOSC.org). He will be available 1 – 5pm on Saturday and 2-6pm on Sunday. Farnsworth’s Revenge is the third humorous novel in the Rollo Hemphill Misadventures series. Rollo once feared the Secret Government was out to get him, but now he’s on a mission to help them out. “Paranoia is just a heightened state of awareness,” Rollo quips bravely, as he caroms around the world in search of the kidnapped life-sized replica of a Hollywood goddess. It’s hardly a spoiler to reveal that it’s easier for him to uncover secrets to cold fusion and global money laundering than to find the missing doll. Farnsworth’s Revenge is now available from booksellers in both softcover and Kindle e-book formats, published by LaPuerta Books and Media. Gerald Everett Jones is a freelance writer who lives in Santa Monica, California, with his wife, actress-comedienne Georja Umano. His first book under the LaPuerta imprint was How to Lie with Charts. He expounds on his notions of male-centered humor in his collection of short stories, Boychik Lit, which includes an essay on the genre. 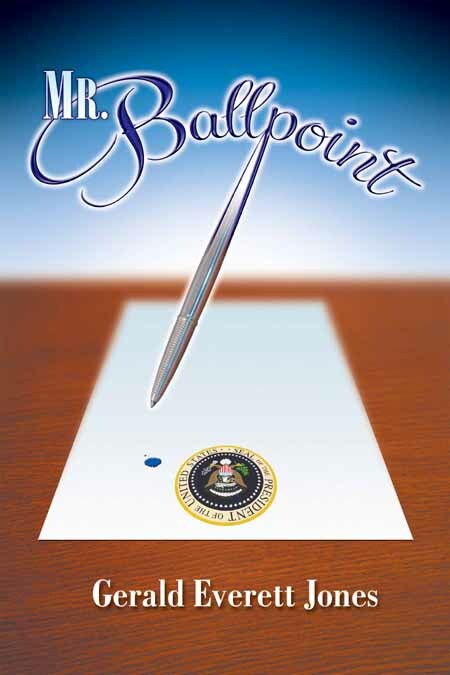 His father-son relationship comedy Ballpoint, written for general audiences, tells how an outrageous huckster brought on the “Pen Wars” of 1945.
is scheduled for release by LaPuerta in September. Claiming he’s inspired by the humor of P.G. Wodehouse and James Thurber, author Jones blogs on the topic of male-centered comic fiction at Boychik Lit (www.boychiklit.com). Santa Monica, CA (April 1, 2014) Boychik-lit satirist Gerald Everett Jones has produced his third novel about geeky genius Rollo Hemphill, a recovering computer hacker whose fate is to fail continuously upward. 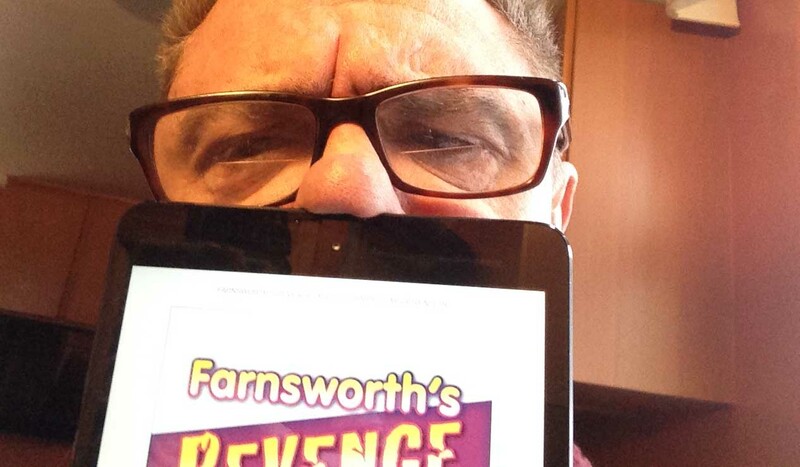 The new title in the series is Farnsworth’s Revenge, released on April 1 in honor of fools everywhere. Rollo once feared the Secret Government was out to get him, now he’s on a mission to help them out. “Paranoia is just a heightened state of awareness,” Rollo quips bravely, as he caroms around the world in search of the kidnapped life-sized replica of a Hollywood goddess. It’s hardly a spoiler to reveal that it’s easier for him to uncover secrets to cold fusion and global money laundering than to find the missing doll. Farnsworth’s Revenge is now available from booksellers in both softcover and Kindle e-book formats, published by LaPuerta Books and Media. In the first book in the series, My Inflatable Friend, Rollo devises a screwball scheme with the lookalike doll to make his girlfriend jealous and stumbles into a gig on shock-jock radio. In the second book, Rubber Babes, he thinks he’s landed a cushy job heading up a Hollywood charity, but he ends up running from the Feds. Now in Farnsworth’s Revenge, he’s on the lam in Europe, when he gets recruited for a secret mission that has him chasing clues from Paris, to Istanbul, then to Nairobi. The painful consequences of Rollo’s comic misadventures show us all too vividly the perils of pretending to be someone you’re not — and the hazards of stroking every male’s most vulnerable part — his swelling ego. Gerald Everett Jones is a freelance writer who lives in Santa Monica, California, with his wife, actress-comedienne Georja Umano. His first book under the LaPuerta imprint was How to Lie with Charts. He expounds on his notions of male-centered humor in his collection of short stories, Boychik Lit, which includes an essay on the genre. His father-son relationship comedy Ballpoint, written for general audiences, tells how an outrageous huckster brought on the “Pen Wars” of 1945. Ballpoint is scheduled for release by LaPuerta in September. The LaPuerta name and its logo — an open door — symbolize unlimited access to knowledge, opportunity, innovation, fascination, and delight (www.lapuerta.tv). For further information, contact LaPuerta’s marketing manager Jason Teahan at jason@lapuerta.tv. Is there an audience for boychik lit? The author of Farnsworth’s Revenge (April 1, 2014) muses on this question on the Boychik Lit blog. Just announced yesterday, almost 100 readers have already joined the contest. Twenty will have prepublication paperbacks to review on Goodreads.com. Giveaway ends December 17, 2013. At Boychik Lit, we ponder the social disparity of women being in the 40th percentile of breadwinners, but their wages still lag behind their male counterparts. Click on www.boychiklit.com to read more! At BackPack Film School, see how 3D special effects may cause the symptoms of seasickness. Click on www.backpackfilmschool.com to give us your views on how it will affect the film industry. At How to Lie with Charts, we take a look at how sneaky ways of “scaling” charts may create an air of fear. Click on www.howtoliewithcharts.com to find the answer!